Here are some of the questions people frequently ask us about storage in Ottawa. Do I have to sign for a certain length of time? No. Our contracts work on a month-to-month basis. Sign for as long as you need – or as little. You can customize the lease length to your needs. How much notice do I have to give before I move out? Please let us know 15 days ahead of your planned move. Are the contents of my unit covered by insurance? No, not unless you take out insurance on your own. Your home insurance policy can probably be amended to cover your stored goods. We offer storage insurance in Ottawa for a fee. Wherever you buy it, we think insurance is a good idea: if it’s worth storing, it’s worth insuring. No, we don’t collect a deposit. Why is the Just Right Self Storage building so clean? That’s how we operate our storage facility. A storage building that is not clean and well-maintained is probably neglected in other ways as well – perhaps in security or customer service. We’re clean, secure, and here to serve your needs. 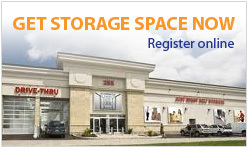 Learn more about our conveniently located storage facility and our storage facility security. We accept Visa, MasterCard, American Express, debit cards, cash or cheques. If you prefer, we can set up automatic payments so you don’t have to remember to send us your cheque or call us with your credit card. This really depends on what you plan to put into your storage unit. To assist you with this process, we have knowledgeable reps available to help you determine exactly how much Ottawa storage space you will need to store your goods.